In this readable, practical textbook Rich Martin explores the core principles and practices that beginning journalists need to produce work that informs and enlightens citizens hungry for accurate and trustworthy news. The textbook’s 16 concise chapters impart real-world examples demonstrating how the best journalists exemplify the key principles, as well as cautionary stories illustrating journalistic mistakes and missteps. It also contains exercises, checklists, tips, and additional resources that students can use in class and independent study, making the book an ideal newsroom and classroom resource that can be returned to again and again for new insights. For journalism to survive and flourish in the 21st century, it needs young practitioners who understand its importance to society, believe in and are committed to its core values, and can put those values into action. This new edition of Living Journalism is an excellent updated introduction to journalism for students, teachers, and young professionals. Rich Martin was a newspaper journalist for 32 years, including 29 years at The Roanoke Times in Virginia. The newspaper was a three-time Pulitzer finalist for projects he edited. He is an associate professor emeritus in the Department of Journalism at the University of Illinois at Urbana-Champaign, where he taught for 12 years and served as Director of Journalism Graduate Studies and Journalism Department Head. 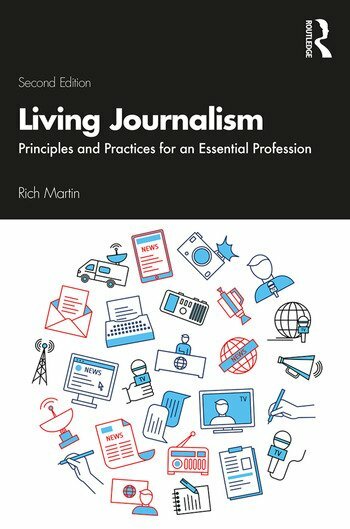 Living Journalism: Principles & Practices for An Essential Profession (1st edition) was published in 2011. He and his wife now live in Fredericksburg, Virginia.